This blog is about brand storytelling and the connection between brand strategy and video storytelling. Is Branding is for the Birds? We finally got some warm weather in Chicago land and I spent a wonderful weekend at Tryon Farm in Michigan City Indiana. Tryon Farm is a community of simple modern homes that have been built to integrate with the natural environment. I am working on a brand story about Tryon Farm and its founders Ed and Eve Noonan. They are a lovely couple and very committed to building a community and homes that help people connect with each other and with nature. The homes have great views of the outdoors. Multi-purpose rooms that help maximize living space and utility. The homes generally have a great room that integrates the spaces typically devoted to living, dining, kitchen so that people naturally interact with each other vs. barricade themselves in large bedrooms. In branding color is a such a strong identifier and way of differentiating one's brand look from competition. Perhaps birds have figured this out? The video above is a fun little compilation of some of the footage from this weekend's shoot. Does your brand need to go on a diet? When packing for a trip it seems like it may be a good idea to pack some nice-to-haves that may come in handy. But extra baggage generally slows us down. Overtime brands also tend to put on some extra baggage via scope creep, over-extension or by growing in ways that are not core to its overriding mission. Refocusing one’s brand is much like pruning a tree – trimming back its branches enables growth. But doing this is not easy. To properly prune a tree one must make drastic cuts that at the time appear to be so extreme as to threaten the life of a tree. These cuts however, are essential to giving the tree the light it needs to grow. So how does one refocus one’s brand, and trim the excess fat and lean up so its true form can shine through? Being both a video editor and brand strategist video editing has taught me much about cutting the fat and how subtraction can make a story flow and better connect with an audience. needed to tell the story. Overtime one learns as an editor how extra stuff just clogs the arteries of a story. So if a brand message or visual branding element is not helping advance your story it should be eliminated. We are told in marketing to listen to our customers but sometimes it is more important to listen to our own voice and follow our true calling. How can we inspire others if we are not passionate about what we are doing and what our brand stands for? By being clear in purpose and inspired by your brand's mission one can focus on doing the things that are necessary to deliver on your brand promise. Having a clear road map provides a filter for: What to do and What not to do. Things that are “off brand” will only be a diversion and take you off course? Build prototypes and see how they feel. If you have a brand presentation, website etc just try cutting elements that are not a top priority. Is the story stronger? Are you still capturing the essence of what makes your brand special? Since we get so close to our brand checking in with others provides us with an objective viewpoint. Sometimes we do not see the obvious or take what we do best for granted. 4. Sleep on it and make a decision. Sometimes it is essential to give oneself some distance and check back in to see what feels right. If you have any doubts just flip a coin. If you feel like re-flipping the coin than your gut is telling you to not go that way. Here is how we helped a non profit fine tune its brand. Emotive Stories rebranded Lambs Farm a place where people with developmental disabilities lived and worked. Lambs Farm has a petting zoo, pet shop and restaurants that serves the public and that provides productive work for their participants. Most people thought of it as a place to bring their kids to pet a goat and had no idea about the wonderful things that went on their to support people with developmental disabilities. So what they did there was amazing but they were not doing the best job of communicating their message. After conducting extensive interviews with all stakeholders; residents, staff, family members, visitors, volunteers, donors and community leaders, we developed the brand idea, “Lambs Farm. Where People Grow” to connect the metaphor of the farm to the organizations overall mission. We created a brand look and voice that was positive, affirming and very human. This message that connected with people on an emotional level. This brand idea inspired their staff and prospective donors. It provided a filter to evaluate marketing programs, community outreach activities such as launching a farmers market to draw the community to Lambs Farm and provided a clear direction to talk about what they do to support people with developmental disabilities. This is a video that we created to communicate this brand message to prospective donors. Do people see themselves in your brand story? Over the past few months, I have been reflecting on getting back to the roots of my brand and how branding like life is a journey towards wholeness. As a brand strategist, I help companies find what their brand stands for and better focus on “its true purpose”. 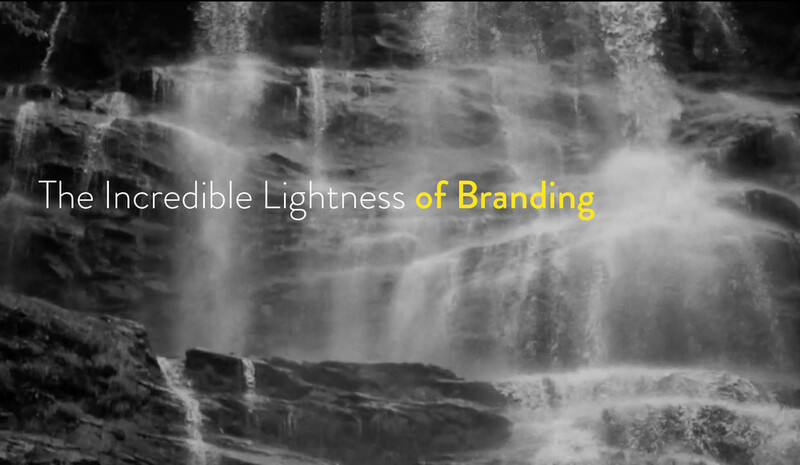 Lightness in branding has many dimensions. It is about shedding weight and bringing clarity and simplification to one’s brand message. It’s about focusing the light of ones brand to maximize its power to connect with people. It’s also about being in the flow and letting a brand's essential being shine brightly. It’s about presenting one's brand in the best light so that others can see the beauty that is core to one's brand. As a filmmaker and photographer, light is essential to creating beautiful inspiring imagery that connects with people. Light and shadow define shape. They add depth. They direct the eye and focus others attention on one's intention. In his novel the Unbearable Lightness of Being Milan Kundera said, “Love is the longing for the half of ourselves that we have lost”. This blog is as much about my journey to keep growing and keep connected with the passion I have for branding. I would like to leave you with a story of love. One I filmed about the bravest, most connected and inspirational person I ever met. Jen was a 36 year old woman with stage IV breast cancer and an angel to other women fighting the disease. She was also a mom. This story is the message of hope and inspiration that she wanted to leave for her 6 year old son Corbin. This story was done for Imerman Angels an organization that matches recently diagnosed cancer patients with people that have lived with the same diagnosis. Jen was and always will be an angel to others.